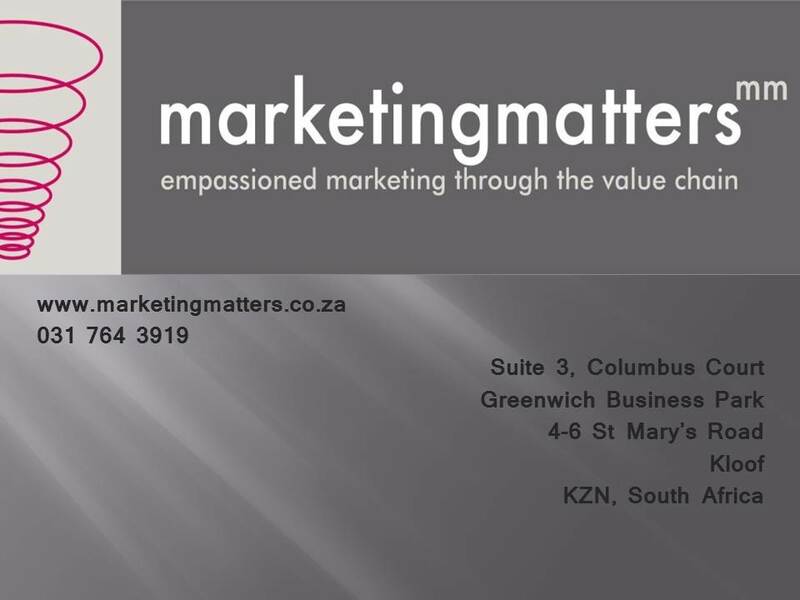 Durban Chamber of Commerce’s Marketing Matters Conference. The countdown to the conference has begun.. with little more than three weeks to go, we are feverishly working at making sure that the Durban Chamber of Commerce’s Inaugural Marketing Matters Conference makes a lasting impression on the minds of its attendees. Every day sees new delegates signing up, and true to form the Durbanites’ enthusiasm has sparked at the last minute – leaving limited space for our fellow marketers from Joh’burg and Capetown. With speakers like Professor Mervyn King, Professor John Simpson, Steven Cohen and other respected thinkers (All movers and shakers in their own right!) this is set to be a one of a kind conference. To find out more about the conference (and see for yourself what we are so excited about) view the following links, or feel free to contact us! Before you go out to enjoy the fun sun and sea of the beautiful South African East Coast, why not attend a day of mind blowing, brain growing interaction with some of our proudly South African thinkers? Join us on 6 December 2011 at the Suncoast Casino in Durban for a strategic marketing conference, and learn more in one day than you have all year. No, we’re not joking! Where else would you be able to hear people like Professor Mervyn King, Professor John Simpson, Advocate Neville Melville, Steven Cohen – Softline Pastel, Andisa Ntsubane – Microsoft, Wayne Phillips – Better and Nonjabula Hlengwa from Transnet, all at the same time. Professor John Simpson, who leads the extraordinary team of researchers at the Unilever Institute of Strategic Marketing, will be revealing his thoughts on the various trends the Institute has uncovered in the market place over this past year. All of which are derived from major quantitative and qualitative research projects, which are then keenly analysed to extract core truths about different strategic segments in our market place. Steven Cohen, who has built Softline Pastel into the leading business management software of South Africa, has managed his business through an active strategic marketing approach. Steven will discuss the impact of technology on product development and how the brand and Pastel Accounting products have evolved due to changes in technology. Advocate Melville, former banking ombudsman, has extracted the crux of the Consumer Protection Act (CPA) and shuffled the sections to provide South African service providers with an easy to read manual. He will speak on the CPA, to help business owners/managers understand what their obligations are to the consumer and how they can protect their businesses. Wayne Phillips is an intuitive and passionate chartered marketer who focuses on green marketing and the lack of attention that the business sector places on the triple bottom line. As a result, he will be speaking on his experience with green marketing and the paradigm shift that is necessary for businesses to survive. So, to answer the question on what these speakers have to do with marketing or why you should be listening to them on the 6th of December, it’s simple. Their wide array of expertise will reveal the golden nuggets that will help turn 2012 into a more profitable and insightful year. Not to mention, the excellent value for money you’ll receive by paying the price of listening to one speaker and receiving the insight of seven master minds. And last but not least, the conference will be facilitated by Jeremy Maggs. His experience as a journalist, of more than 20 years, across various media platforms, has resulted in him being the perfect candidate to facilitate this conference and leave a memorable impression. So book your seat, and enter 2012 with strategic inspiration! We have posted our first blog post! Let us know what you think.